After the evening show of the spinning Sufis of al-Tanoura, Cody and I met up with a friendly local, Mohsen, who wanted to show us around Islamic Cairo at night. Armed with my SLR camera, we walked back in time and experienced a Cairo that probably hasn’t changed much in a couple centuries. 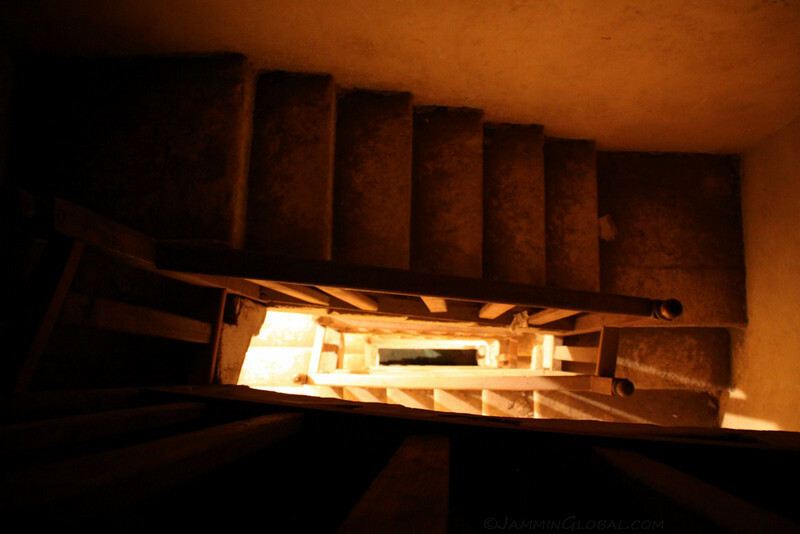 This next installment of photos is from an evening stroll down one of the oldest streets in Cairo, al-Muizz. It is said to have the greatest concentration of medieval Islamic architecture. After taking in some of the stalls, we got access into the al-Mu’ayyad Mosque with some excellent skyline views of Islamic Cairo at night. This part of Cairo isn’t any more Islamic than other parts of Cairo, but this is the nucleus from which the modern city has grown from and it contains many historically important Islamic monuments. 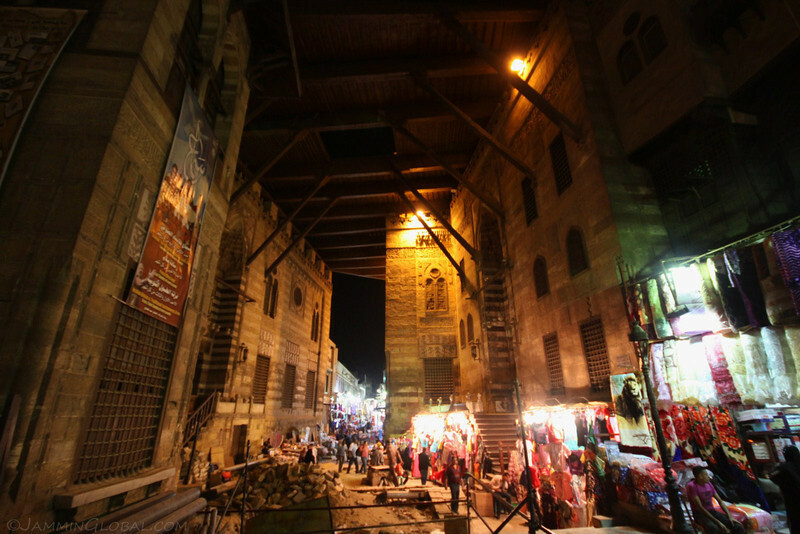 Under the giant Ghuriya Complex looking towards the southern section of al-Muizz Street, whose full name is Shari’a al-Muizz li-Deen Illah. 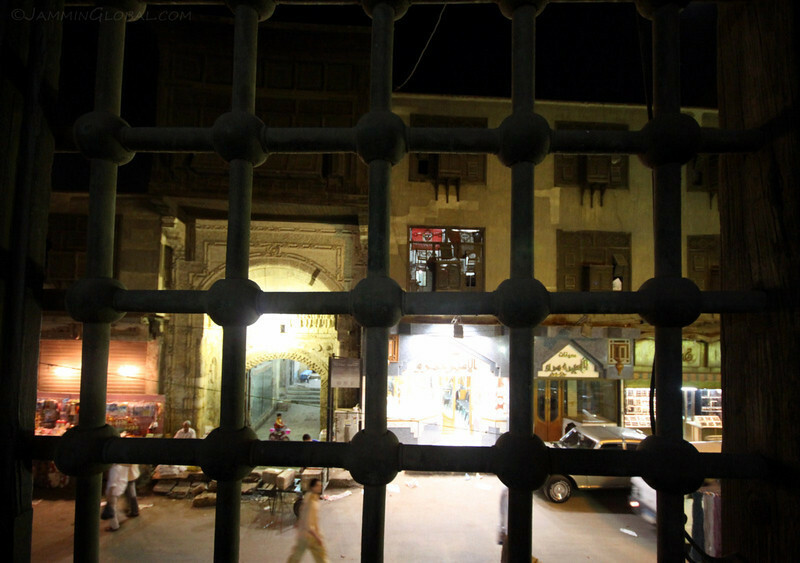 The al-Tanoura performance was in the building to the left and behind the complex lay a maze of small alleys with shops in every nook. 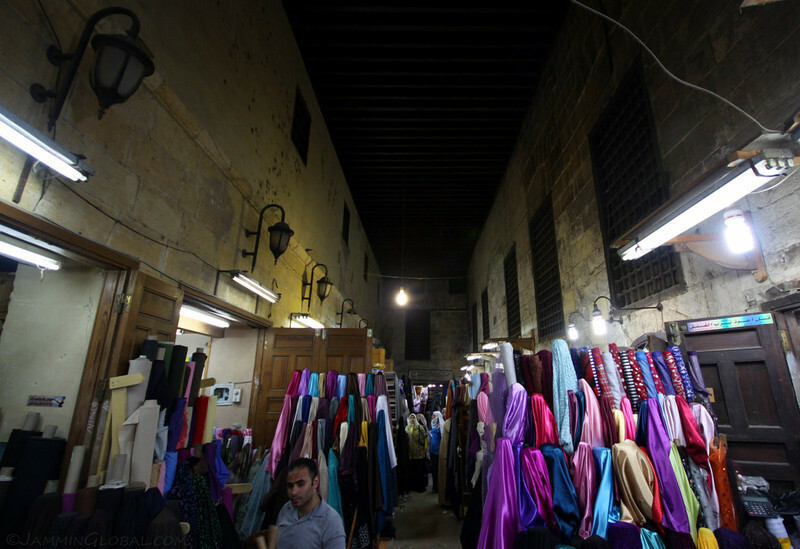 There were mainly textile shops on this side of Azhar Street with the Khan el-Khalili souk on the other side. The enthusiastic man in the foreground is Mohsen, who approached Cody and I as we were walking to the al-Tanoura performance and told us he would take us around later. We asked him if we had to pay for this tour and he said not at all, he was just glad to show us around his neighborhood. Cody is a well-built man and this merchant requested to arm-wrestle him. I think Cody won. A very narrow textile shop in what used to be stalls for horses. 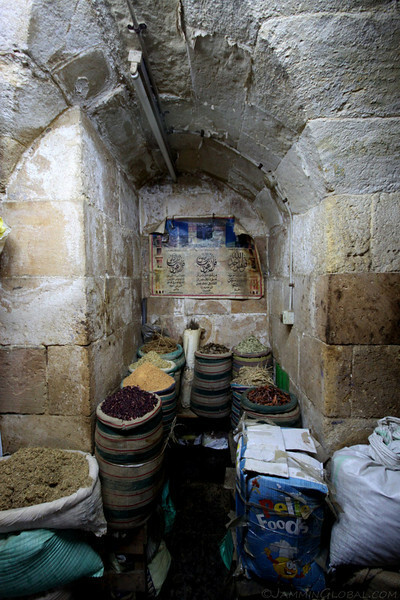 This is under the Ghuriya Complex, which was built by the last Mamluk Sultan, Qunsuh El-Ghuri in 1505. The merchants were quite happy to have their photos taken. Another horse stall turned into a spice cellar. 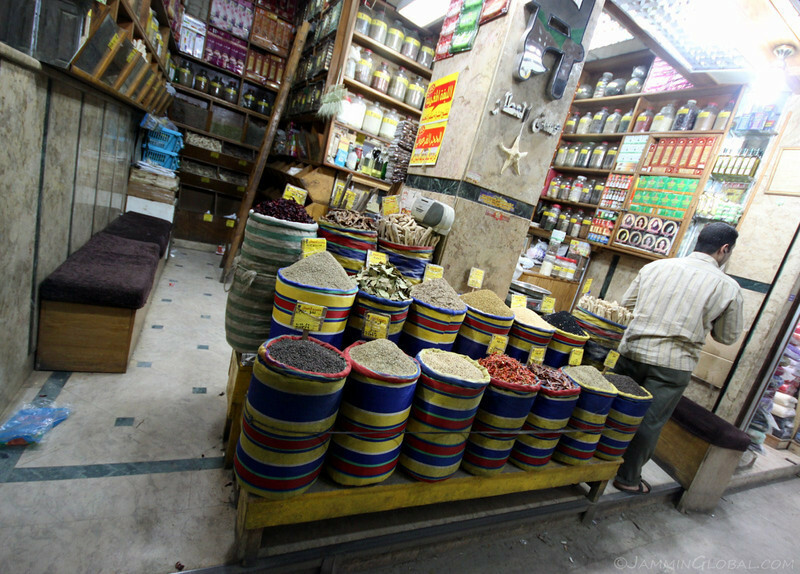 Spices in a more standard shop on the main al-Muizz street, which has been an active commercial and religious area since Cairo’s founding in 969 AD. An array of mannequins displaying various ascents on black Abayas, the traditional dress, which started out as a simple cloak to veil the whole body but has progressed today into fashionable wear. Beyond just the colorful embroidery on the sleeves, a really radical Egyptian woman might opt for the hot pink abaya. Truth be told, the Islamic fashions these days don’t leave much to the imagination. 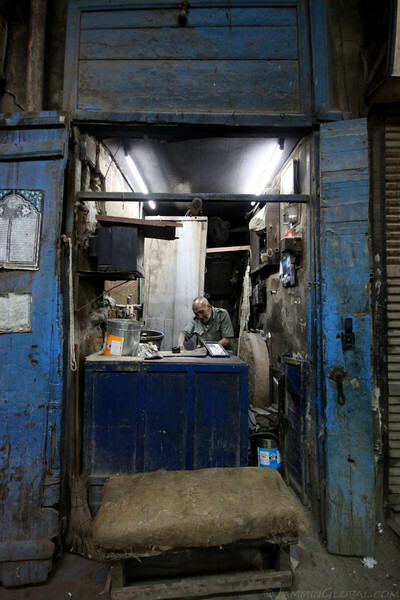 A little further down al-Muizz and we came upon this knife sharpener, who was hard at work past 9 o’clock in the evening. 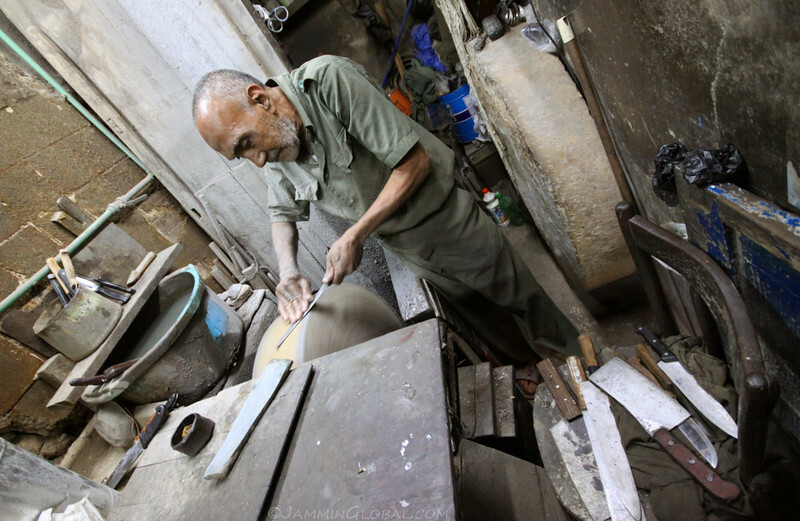 Two big grinding stones being used to sharpen a variety of knives. He showed us some old photos of him in this shop when he was much younger. That must be some kind of dedication if he’s been at that spinning wheel for a couple decades. 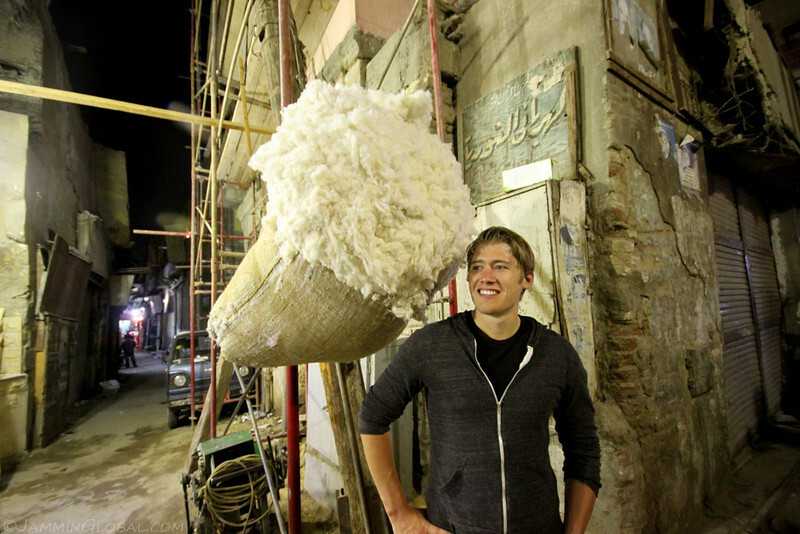 There was an open bale of cotton hanging in the street and I told Cody to stop there to get some perspective. Fine Egyptian cotton was being spun into textiles to be sold in the markets, just like it’s been since antiquity here. 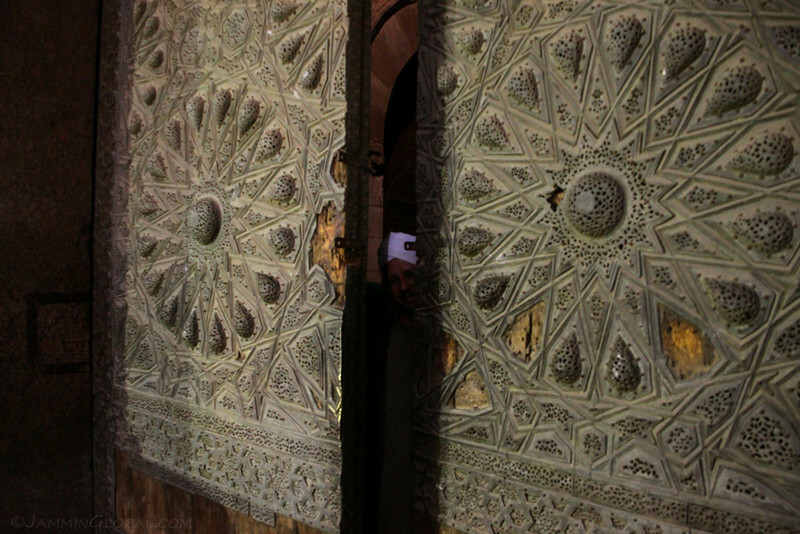 At the entrance to the al-Mu’ayyad Mosque, situated at the southern end of al-Muizz street. 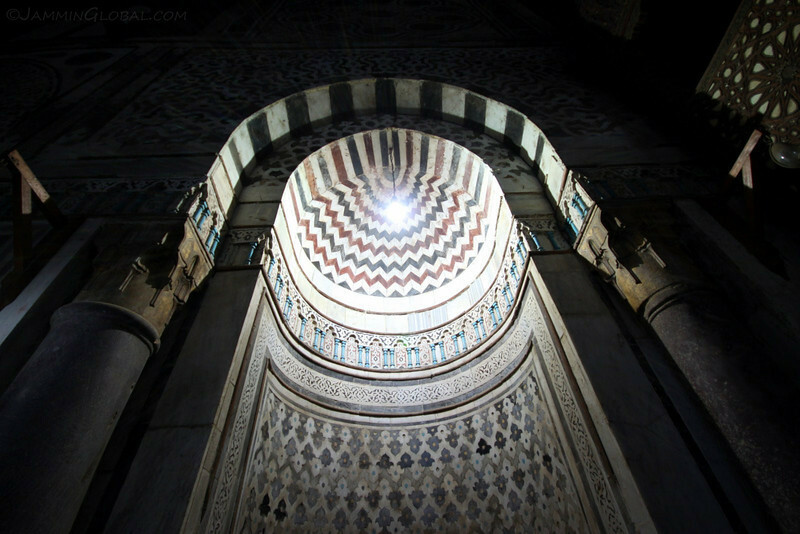 This is the Muqarnas Portal, which is framed by square Kufic inlays that portray the Shahada, the first pillar of Islam – there is no god except Allah and Muhammad is his prophet – a central belief of all Muslims. 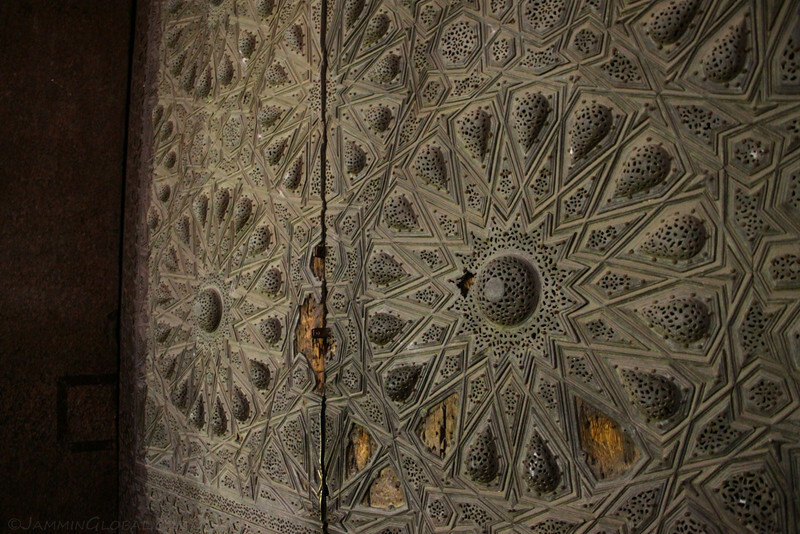 The giant doors showcasing medieval Islamic bronze metalwork. 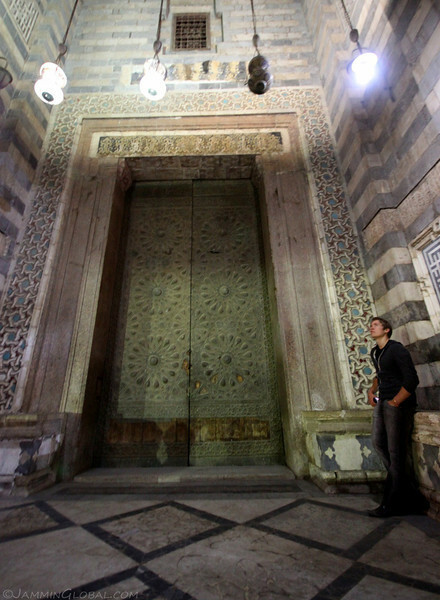 These doors were taken from the Sultan Hasan Mosque, which is actually illegal according to Islamic law, but I guess a powerful enough patron can get away with it. Moshen made a phone call and the caretaker of the mosque let us in to take a look (after a LE30 ($5.50) donation). 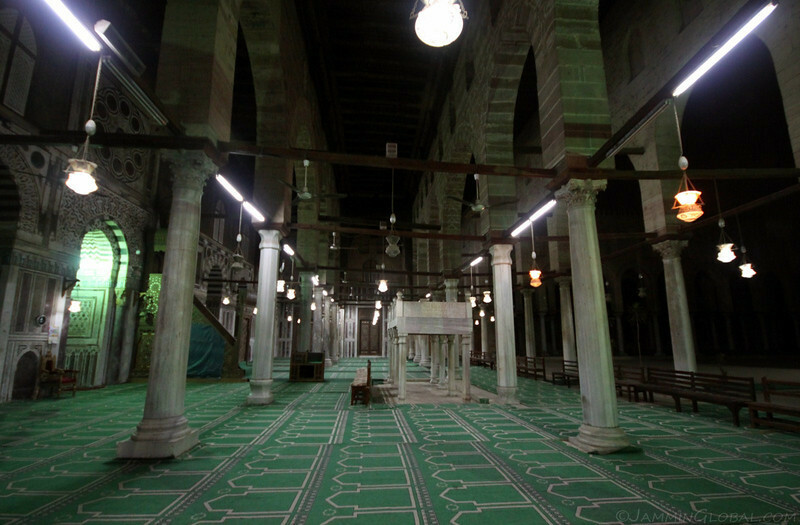 The main prayer hall of the al-Mu’ayyad Mosque. This was a rare opportunity as non-Muslims usually aren’t allowed inside mosques and that too to photograph them. I hope it was respectful enough that I didn’t use flash. 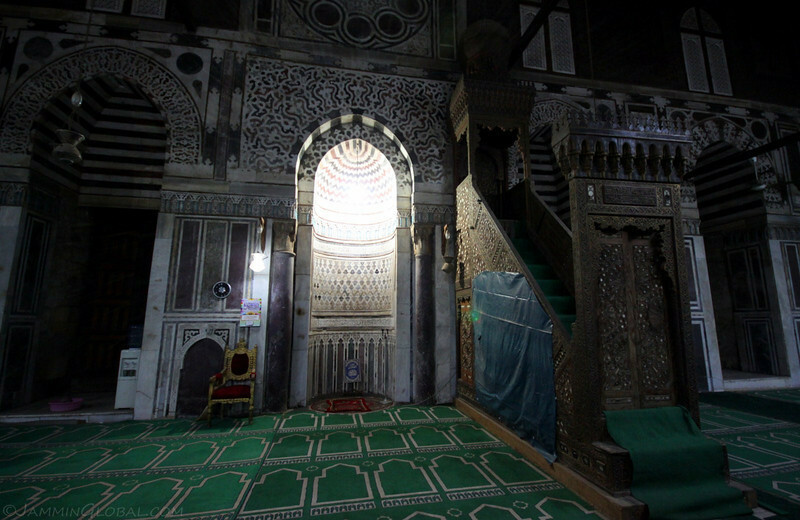 The focal point of the mosque is the mihrab, a niche indicating the qibla, which is the direction of prayer, pointing to the Ka’aba in Mecca. 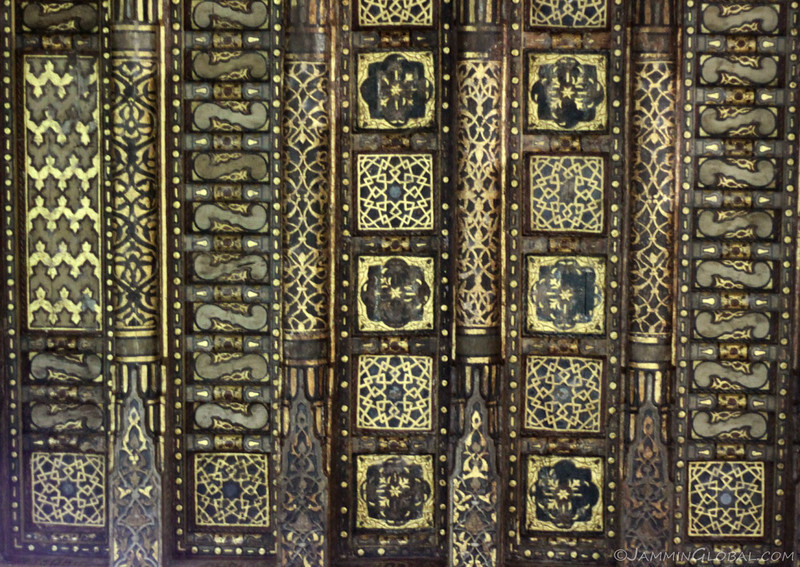 To the right of the mihrab is the minbar, a raised pulpit from where the imam gives the Friday sermon, which was finely decorated in wood with marble inlays. The top step of the minbar is reserved for the Prophet Muhammad, so the imam occupies the second highest step. The colorful stone inlays in the marble of the mihrab. 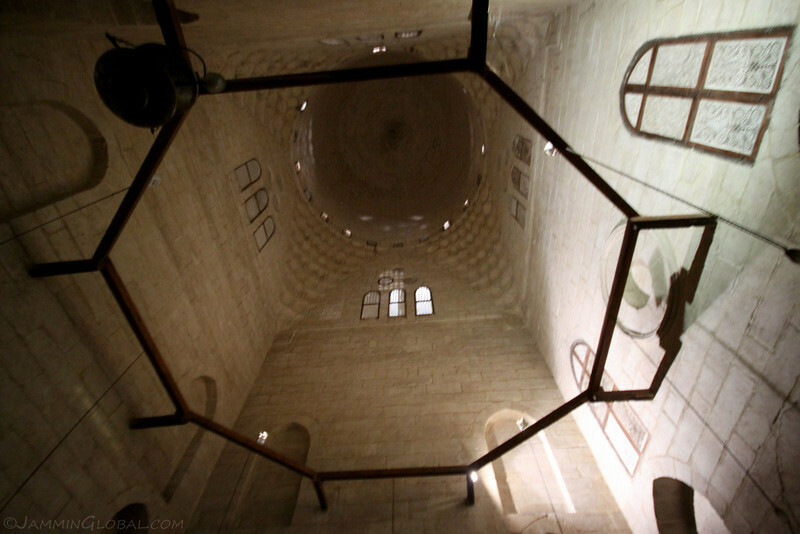 The high ceiling under the dome of the mosque, which housed the tombs of the mosque’s patron, Sultan al-Mu’ayyad and his son. 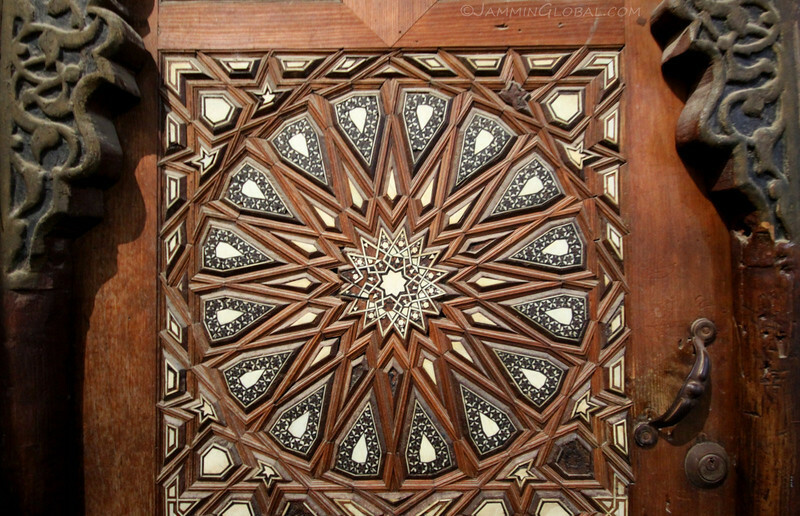 Marble inlays in fine woodwork on a door in the mosque. A view of the prayer hall from the courtyard. A portion of the painted and gilded wooden ceiling. 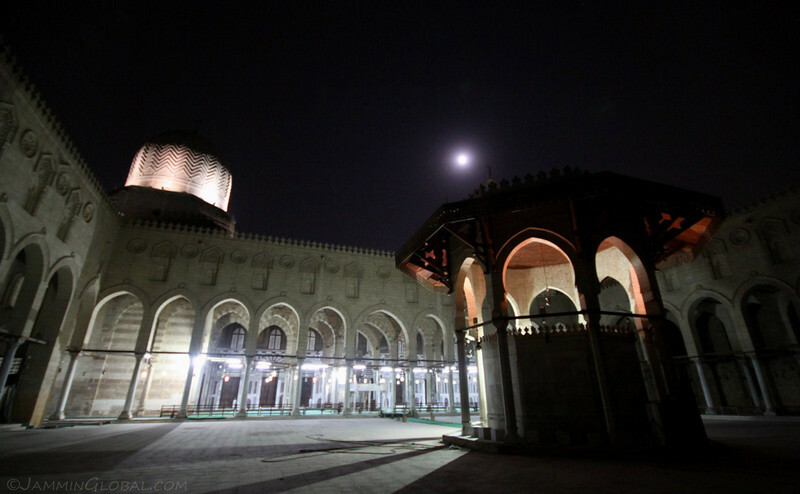 The courtyard of the al-Mu’ayyad Mosque with the water basin in the foreground and the dome on the roof with the full moon up in the sky. A view through a window in the mosque to life on the streets outside. 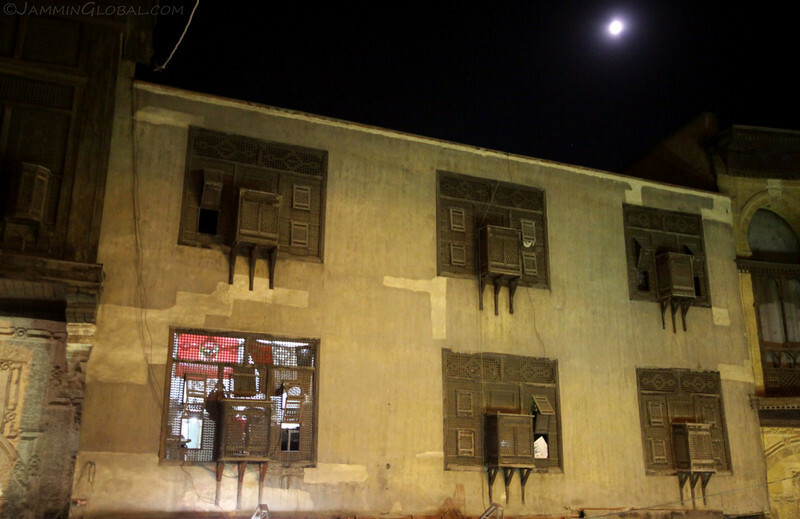 The living quarters of the religious scholars, across from the mosque. 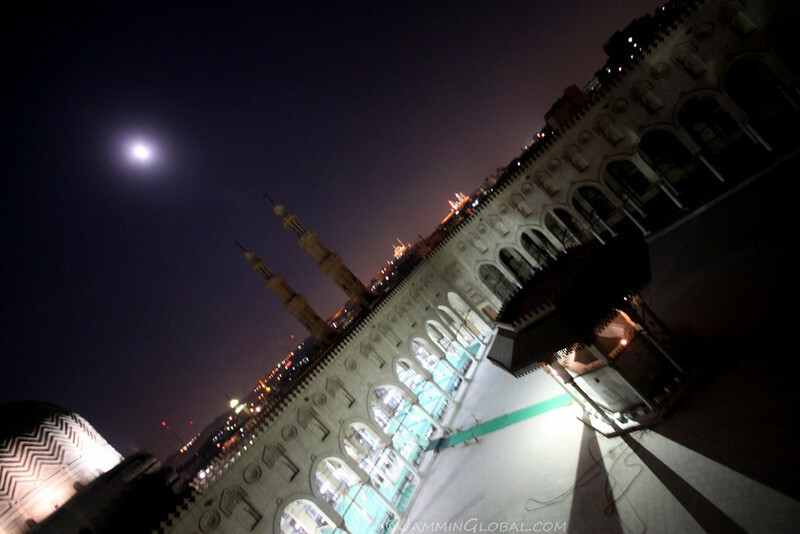 …the rooftop of al-Mu’ayyad Mosque with its dome and the twin minarets of Bab Zuwayla, the southern gate of the old Fatimid City. 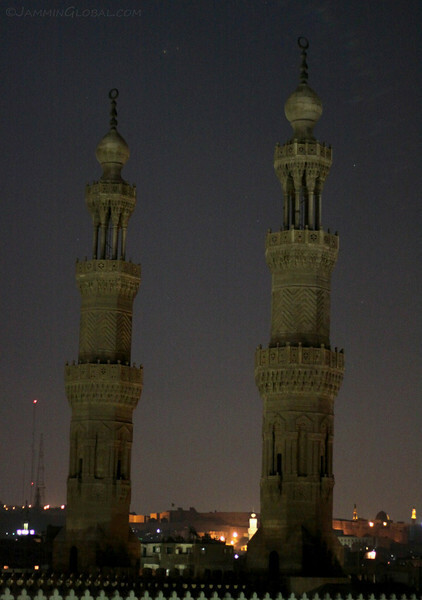 The twin minarets of Bab Zuwayla with the signature decoration from this period of Mamluk architecture of zigzags. 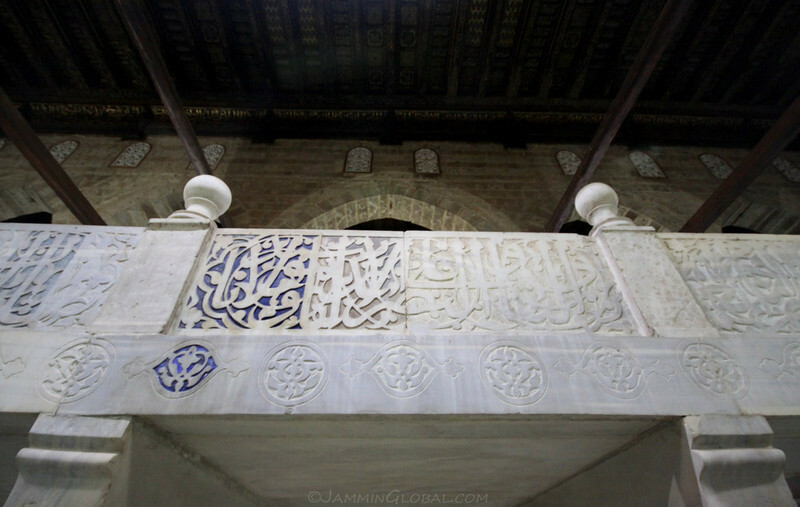 The architect of this mosque is known as he carved his name on the staircase; al-Mu’allim Muhammad Ibn al-Qazzaz finished this Islamic icon in 1420. 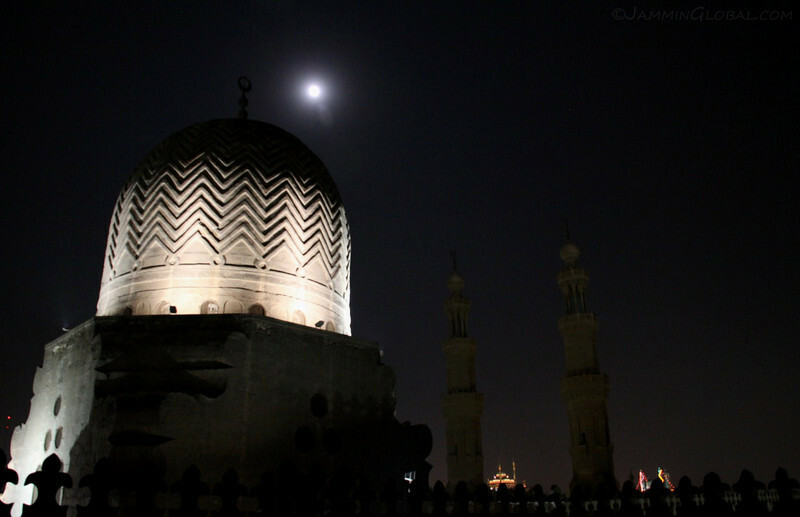 The zigzags on the stone dome with the full moon up high. 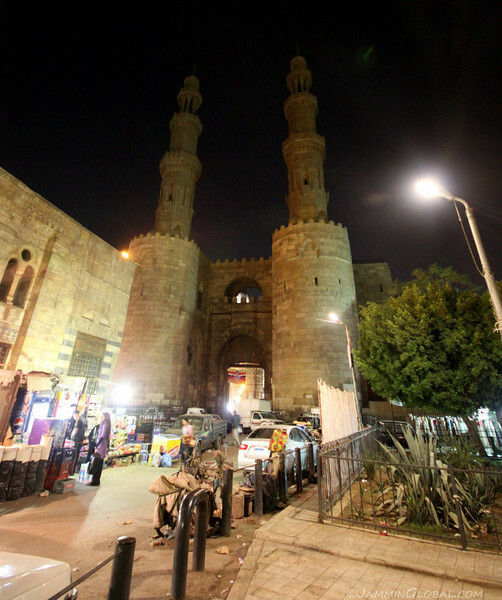 In between the minarets is the lit-up Cairo Citadel, built in the 12th century. We thanked the caretaker of the mosque for letting us in and the tour concluded as we reached Bab Zuwayla, the southern end of al-Muizz street. The fortified gate was built on the southern limits of the old Fatimid City in 1092 to protect it from the crusaders and other attackers. 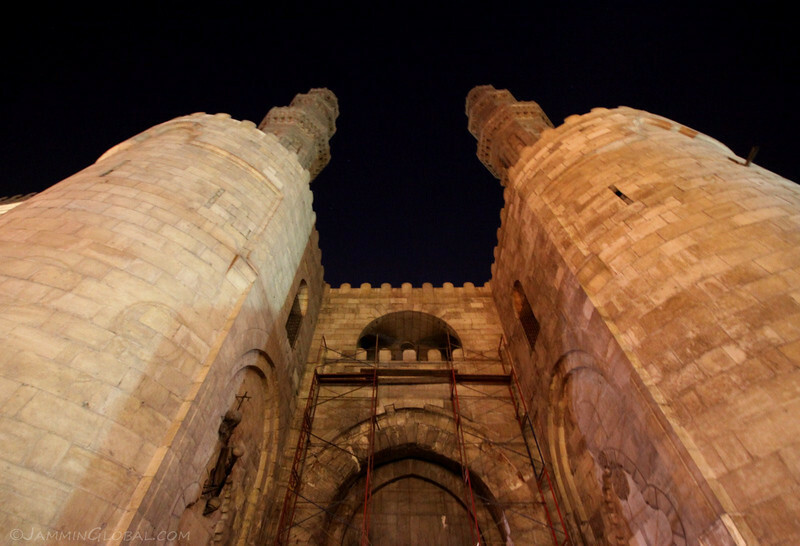 The slender minarets were built on top of the large gate as the architect of al-Mu’ayyad mosque, al-Qazzaz, used its proximity to the gate to incorporate them into the structure of the mosque. 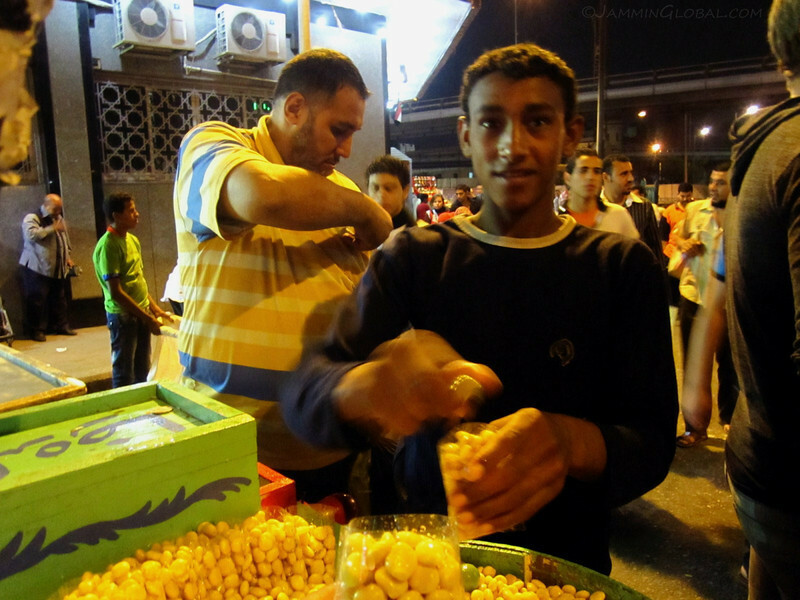 Walking back to the Metro and grabbing a street snack of boiled lima beans. I thanked Mohsen for taking us on the tour and showing us a glimpse of Old Cairo. I could just imagine how things probably haven’t changed much in the past few centuries or even the millennium that Cairo has been in existence for. 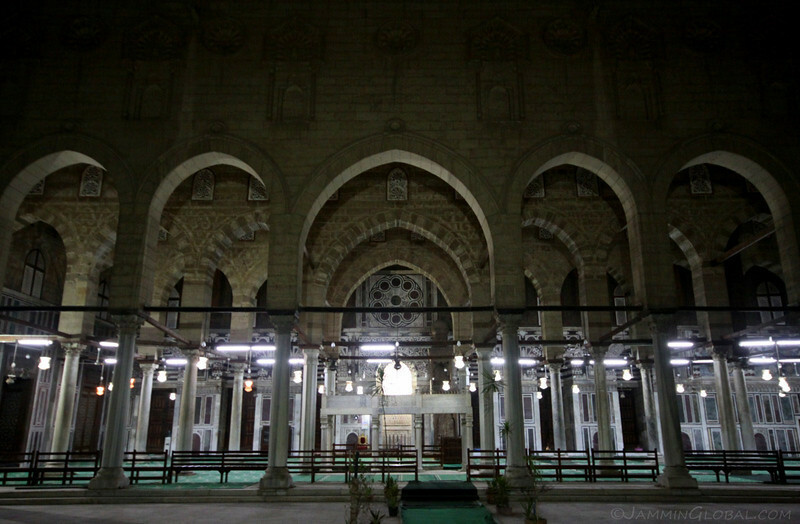 Here I could see how the religious side and cultural side of Islamic Cairo are tightly interwoven. The mosques are a focal point of daily life, but surrounding them is the buzz that has kept this city alive through the ages. I hope not much changes here in the next thousand years.